In 1951 two intrepid women, Phyllis and her best friend, Anne, set off on a journey from Victoria, British Columbia, to Red Deer, Alberta, and back again. Travelling first by 1927 MG Roadster to Alberta, and then on horseback on the way home, the journey took months and would test the women’s wits and resourcefulness at every turn. Phyl and Anne documented their adventures and the stories of the people they met along the way in a journal, which was passed down to author Emily Ursuliak, Phyl’s granddaughter. Throwing the Diamond Hitch-an inventive, poetic retelling of the Phyl and Anne’s journey-crackles like the starter of an old roadster, and kicks like a stubborn pack pony. Ursuliak employs a variety of poetic styles and approaches to capture the personality of the two women and the motley of characters they encountered on their trip. 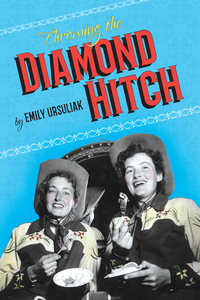 Ride along with Phyl and Anne, and discover how to throw the elusive diamond hitch. Emily Ursuliak writes both poetry and fiction. She holds an MA in English from the University of Calgary, and a passion for literacy and her chosen career, librarianship. She is the host and producer of CJSW’s literary radio show, Writer’s Block, where she interviews authors, records readings, and peers into the private libraries of Calgary book lovers. She calls Calgary, Alberta, home. Throwing the Diamond Hitch is her first book.